February 14, 2019, will be A Day of Service and Love at Marjory Stoneman Douglas (MSD) High School. It will be a day to give back to the community in honor of MSD’s 17 fallen eagles, the students and staff who were lost one year ago. The school will be open from 7:40 a.m. until noon, during which time students can participate in service projects including serving breakfast to local first responders and packing meals for undernourished children. In addition, at 10:17 a.m., the entire District, the community-at-large, and everyone in Broward County and beyond is asked to observe a moment of silence to honor those whose lives were lost and recognize those injured during the Marjory Stoneman Douglas High School tragedy. Schools will remain open and operate on normal schedules on February 14, 2019. Schools are encouraged to participate in A Day of Service and Love and engage students in school-based activities that serve others within their schools or local community. Specific activities will vary per school. 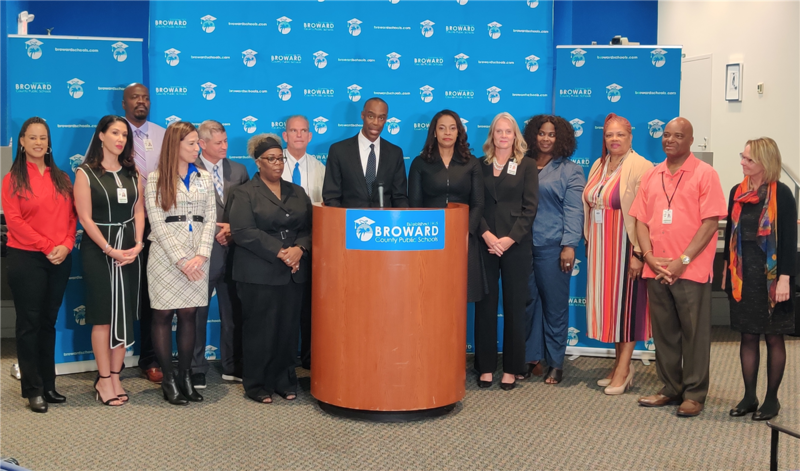 Broward County Public Schools Superintendent Robert W. Runcie has invited Florida’s 66 other school districts to virtually join Broward County Public Schools in the one-year commemoration of the Marjory Stoneman Douglas High School tragedy. Monday - Friday noon - 7 p.m.
Saturday - Sunday noon - 5 p.m. The BCRC is available to the entire community. Allows individuals to instantly report suspicious activity to the appropriate law enforcement agencies and school officials. The app is free and available for download on Apple and Android mobile devices. The Florida Legislature directed the development of this tool through the Marjory Stoneman Douglas High School Public Safety Act. Supported by Broward Sheriff's Office (BSO) - allows individuals in Broward County the ability to communicate with law enforcement seamlessly and report potential threats and suspicious activity. The app is free and available for download on Apple and Android mobile devices.